The Book Tart Quickie with Stephanie Tyler + Contest! I am so happy to welcome Stephanie Tyler to The Book Tart to celebrate the release of the first book in her brand new Section 8 series, Surrender ! Stephanie: Thanks for inviting me Kat, and for saving me some Girl Scout cookies! I completely understand about the chocolate emergencies, I’ve had a few myself. Stephanie: I love laundry! When it is done by someone else of course. 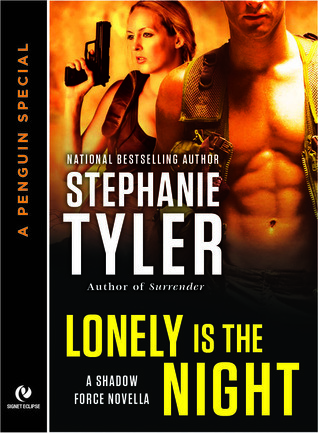 Lonely is the Night, which released earlier in March, is the 5th in the Shadow Force series—it’s a longer novella (about 35K) and it focuses on Reid and Grier, whose relationship ended on a bit of a cliffhanger in the previous book, Night Moves. Surrender, book one in the Section 8 series is all set and ready to greet the world on April 2nd. I just handed in Unbreakable, which is book 2 in the Section 8 series and I’m just about to start the third book in the series! Lots of romantic suspense coming your way! Stephanie: I have plans for a couple of the characters you’ve already met in Shadow Force series. But I do feel as though I’ve brought the Shadow Force series into the Section 8 series at this point, with Lonely. So, no matter what it’s called, yes, you’ll keep seeing those characters. And Sydney Croft has a new ACRO book coming out! Into The Storm. Very excited about that! Me: *Couch Kermit flail* Me too! Ok, hon…. We’re almost done but there’s still time for…..
From the looks of things it appears I collect dog toys. Do you still have any music on vinyl or cassettes? I would have to look in storage to see if there’s any cassettes I don’t know about, but I am pretty tidy about my music. One that had absolutely no calories but tasted like a 5 course meal! Not unless you count waiting until the last minute to get things done as living dangerously. Which it is! *head/desk* I’m “good” at that myself. I thought long and hard on this, but everything that popped into mind made me think of everything that went wrong in “The Fly” so I think I would leave well enough alone. Natural drying if I am not in a hurry. Better for the hair, and I’m a no fuss person. Me: Stephanie! Thank you so much for playing my silly games here at The Book Tart, 😀 You Rock! New York Times Bestselling author Stephanie Tyler writes what she loves to read – romantic suspense novels starring military heroes and paranormal romance novels novels starring warrior heroes, all complete with happy endings. She also co-writes as Sydney Croft. She lives in New York with her husband, her kids and her crazy Weimaraner, Gus. Paranormal is my absolute favorite, but I love romantic suspense too! Surrender sound awesome. I can’t wait to see how they work out their issues! Thank you for joining in on our quickie 😉 Have a cookie… I’m going to buy more chocolate today so I can share. Sounds interesting, I’ll have to check out this series. I love ST’s Dire Wolves series. Previous PostPrevious Spotlight on Meg Benjamin’s Bolted + Excerpt + Contest!